ColorComm, the nationâ€™s premier membership organization for women ofÂ colorÂ in communications, today announced the eight women to be honored at theÂ ColorCommÂ CircleÂ AwardsÂ onÂ Wednesday, July 29, 2015. TheÂ ColorCommÂ CircleÂ AwardsÂ are the highest honorÂ awardedÂ to a select group of women who are changing the face of the communications industry.Â TheÂ ColorCommÂ CircleÂ Awards will take place opening night duringÂ ColorCommâ€™s Annual Conference in the Grand Ballroom at the Ritz Carlton Key Biscayne in Miami, Florida. CNNâ€™s Lisa Ling will serve as the keynote speaker at theÂ ColorCommÂ CircleÂ Awards. EmmyÂ AwardÂ Winning Journalist and Entrepreneur Sheila Brooks, CEO, SRB Communications will serve as the mistress of ceremonies for the occasion. The audience will also hear remarks from Dr. Johnnetta B. Cole, Director, National Museum of African Art. 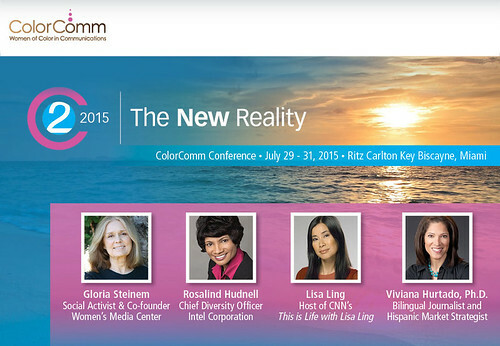 ColorCommâ€™s Conference 2015 (C2: The New Reality) will bring together 300 multicultural women in business from across the country. Prudential is the presenting sponsor of C2 2015. Sponsors include: Coca-Cola, Toyota, MSLGROUP, Publicis Groupe, Weber Shandwick, McDonaldâ€™s, Verizon, Edelman, BET Networks, Ketchum, Burson-Marsteller, African Pride, Fleishman Hillard, CBS Corporation, and many more.Â PR Week, LATINA, AUDREY,Â and BlogHerÂ are media partners ofÂ ColorCommâ€™s Conference. Next Sette Osteria on 14th : Many Reasons to Mangia! Mangia!